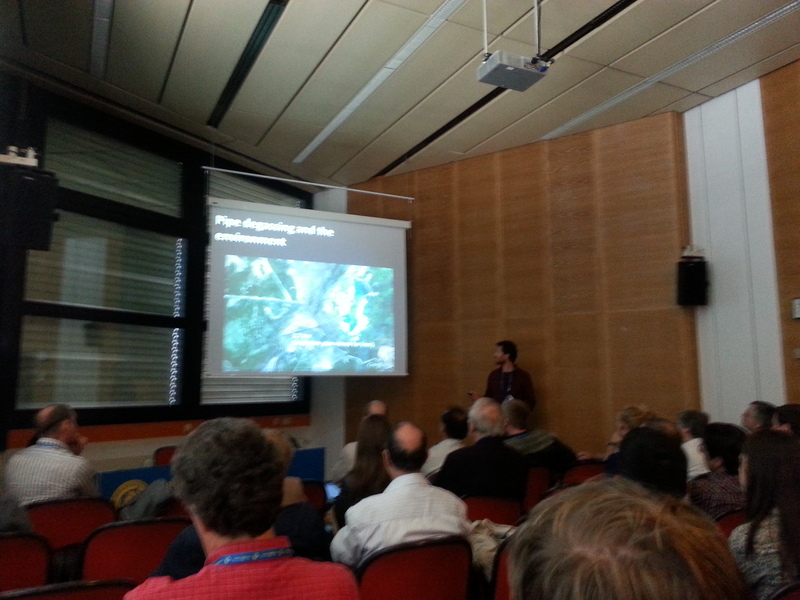 EGU2014 Thursday: “Volcanism, Impacts, Mass extinctions and Global environmental change” – a brief review of two talks. 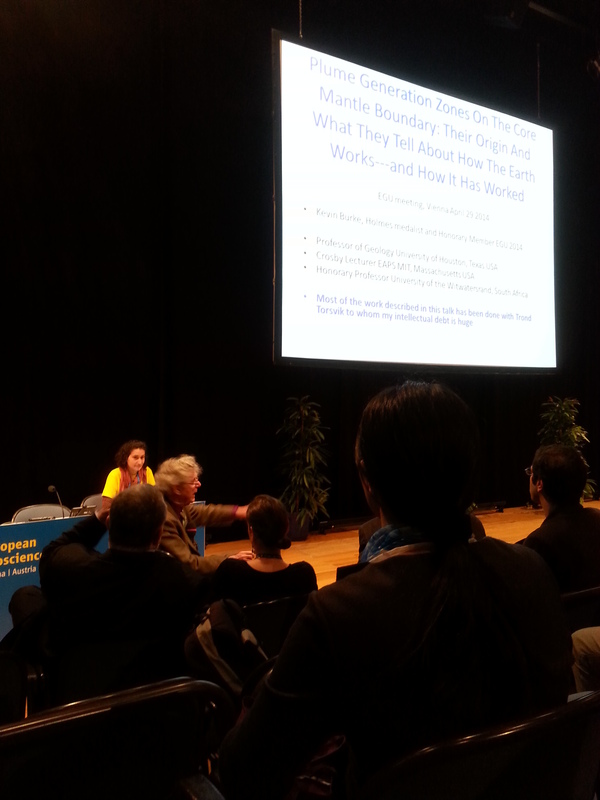 Posted on May 1, 2014 by Sofie L.
Thursday afternoon at the EGU2014 was totally dedicated to the session “Volcanism, Impacts, Mass extinctions and Global environmental change” in which I also presented a talk. The session contained a total of eleven oral presentations covering various subject within the above mentioned topics. The first four talks were on the volcanism of the Siberian Traps and the end-Permian mass extinction event. In the first talk, Seth Burgess presented new high-resolution geochronological data for the intrusives of the Siberian Traps. Burgess and his colleagues had used the same analysis and standards on not only zircons from the Siberian Traps, but also on zircons from the ash-layers bracketing the end-Permian mass extinction level at the GSSP Meishan in China. According to these new datings all the dated intrusives post-date the end-Triassic mass extinction event. Seth Burgess stated that although these data could be taken as “the nail in the coffin for the theory that the intrusive activity caused the mass extinction” he didn’t believe that they did. He then went on to explain that the majority of the intrusives of the Siberian Traps are situated at depths and those that have been dated are the ones that are accessible, probably producing a biased record. This was good news for the second speaker, Henrik Svensen, who presented a talk on the sill-induced evaporite and coal metamorphism of the Siberian Traps. Svensen and colleagues showed that the Siberian Traps contain very thick sills that have been emplaced into both coal-bearing sediments and salt deposits, with the potential for degassing of both green house gases (CH4, CO2), aerosols (SO2), and ozone destructive gases (CH3Cl, CH3Br), which could explain the end-Permian biotic crisis. A fuzzy picture of Henrik Svensen and his audience. Posted on April 29, 2014 by Sofie L.
The number 1 highlight of Tuesday was the Arthur Holmes medal lecture by Kevin C.A. Burke: Plume Generation Zones On The Core Mantle Boundary: their origin and what they tell about how the Earth works – and how it has worked. Burke, who due to health issues had to remain seated during his hour-long lecture, captivated his audience with his warm and humoristic and insightful review on how and where in the Earth’s interior volcanic plumes are formed. If you are interested in large igneous provinces, flood basalts, hot spots etc I strongly recommend you to check out the streamlined talk at the EGU2014 website. Natural hazards: Are we being responsible? Posted on November 14, 2012 by Sofie L.
Last month the hurricane Sandy hit the east coast of the United States full force. The evacuation plans set up by the authorities have with all certainty spared many lives, but the devastation to infrastructure, homes and business will take a long time to repair. If anything, hurricane Sandy demonstrates the vulnerability of our society to natural hazards. Are we being responsible when we plan and build our communities? Are we considering the risks not only for our own generation but for those to come when we develope land areas in risk zones? Some natural hazards are unpredictable, but many are regularly occurring events. We should have learned from our history by now. The 79 AD destruction of the Roman cities of Herculaneum and Pompeji by the eruption of the stratovolcano Mount Vesuvius is estimated to have caused the death of 16.000 people due to hydrothermal pyroclastic flows. During the last 400 years Vesuvius has had 23 fairly severe eruptions, with the last one occurring in March 1944 when several villages in the area were destroyed. Vesuvius is considered one of the most dangerous volcanoes in the world with some 3 million people live in the city of Naples and surrounding areas. Evacuation plans exist but the question is if they are effective enough considering that Naples experiences traffic jams on a daily basis? This Advanced Spaceborne Thermal Emission and Reflection Radiometer (ASTER) image of Mt. Vesuvius, Italy was acquired September 26, 2000. The full-size false-color image covers an area of 36 by 45 km. Vesuvius overlooks the city of Naples and the Bay of Naples in central Italy. In 79 AD, Vesuvius erupted cataclysmically, burying all of the surrounding cites with up to 30 m of ash. Picture and text borrowed from NASA Earth Observatory. Click the photo to go to that webpage. Mount Vesuvius is not the only active stratovolcano situated in a densely populated area, other examples are Mount Fuji in Japan and Popocatepetl in Mexico. Global seismic activity map provided by the UN. Are we being responsible when we plan and build our communities? Are we considering the risks not only for our own generation but for those to come when we develope land areas in risk zones? Origin of life on land and not in the sea? Posted on February 23, 2012 by Sofie L.
In an Early Edition Open Access article in PNAS “Origin of first cells at terrestrial, anoxic geothermal fields” Mulkidjanian et al. explore geochemical evidence for the origin of life on our planet. They find that all cells contain much higher amounts of potassium, phosphate and transition metals than any modern environments such as lakes, rivers and oceans, or for that matter reconstructed ancient such environments. They speculate that these higher levels of various elements are an inherited reflection of the inorganic environment in which the primordial cells were once formed, and use the geochemical composition to investigate suitable “cradles for life”. Their results point to an origin of life, not in the oceans as we are used to, but in anoxic geothermal/volcanic fields on land, where the right geochemical conditions could be found. They argue that such anoxic geothermal/volcanic field on land could stay more or less unaffected by variations in the primordial climate for millions of years, long enough not only to form these “protocells” but also to sustain evolution of the first life forms. In contrast to deep sea hydrothermal vents, which have also been suggested as “cradles of early life on Earth”, geothermal fields on land where subjected to weak solar light from the young sun which would probably be of benefit to the process. It is a very interesting theory. But how, when and why did the evolution process move into the sea? Posted on December 9, 2011 by Sofie L.
Iceland’s biggest volcano, Katla, is rumbling. During the last month there have been more than 500 tremours in and around the caldera. Reaching 1512 m a.s.l. the 10 km wide caldera poses a more severe threat than the recent eruptions of Grimsvötn (May 2011) and Eyjafjallajökull (March 2010), where especially the latter caused major disruptions in the air traffic over northern Europe. The caldera is partly capped by a glacier. If Katla erupts melting glacier ice could cause flash mudflows. Volcanic ash from Katla also have the potential of reaching higher up in the atmosphere, casing devastation not only on Iceland. In 1783 the Laki fissure eruptions, located within the same volcanic zone as Katla, erupted continuously for 8 months. 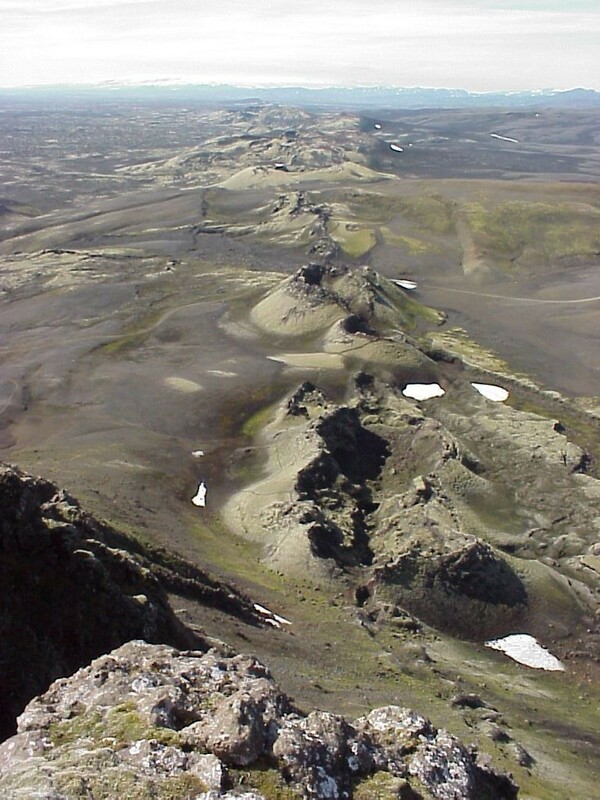 A minor version of the floodbasalt volcanism typical of large igneous provinces, the Laki fissure released huge amounts of ash, hydroflouric acid and sulfuric acid (Stephenson et al., 2003), causing massive destruction on Iceland, where every fifth islander and half of the livestock were killed. But the devastation reached farther than that. A sulfuric ash cloud from the eruption was distributed over the northern Hemisphere. Historical records from France and England report severe health issues for both people and animals, as well as misgrowth of crops and fruit. In the aftermath of the atmospheric pollution from the Laki eruptions, colder climate and increased mortality plagued Europe for a decade (Grattan, 2005). 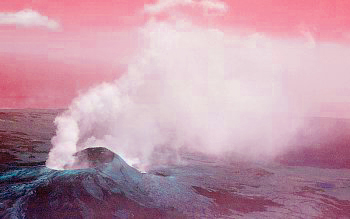 Historical records show that Katla usually erupts every 40-80 years. The last major eruption was in 1918. Volcanologists are worried because they are not sure what to expect. Volcanoes are unpredictable and the impact of an eruption depends largely on its size, volume, ash composition and climatic conditions.